RMHC Manitoba guests, the Finnimore family, in the Ronald McDonald House playground area. Ronald McDonald House Charities Manitoba (RMHC Manitoba) offers many different ways for volunteers to get involved! See below for the many ways you can help us keep families close when they need it most. 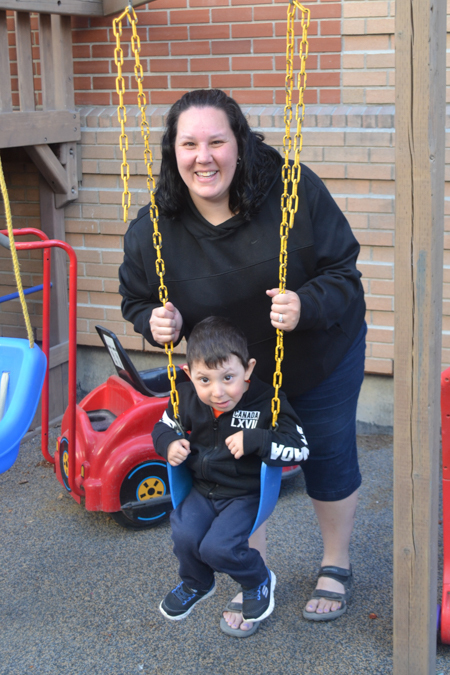 Located at 566 Bannatyne Avenue in Winnipeg, the Ronald McDonald House is a "home-away-from-home" for out-of-town families who are in Winnipeg while their child is receiving treatment. Volunteer shifts are available 7 days a week in 3 hour shifts, 10 am - 1 pm or 4 pm - 7 pm. Volunteers help by prepare bedrooms upon a family's departure, wash and put away linens, checking families in or out, answering the phone or other light administrative tasks, baking, interacting with families and being available to assist families with their stay. Parking is provided. Inside the walls of Children's Hospital at 840 Sherbrook Street in Winnipeg, the Ronald McDonald Family Room offers a home within the hospital for any family with a sick child. Volunteer shifts are available seven days a week from 9 am - 1 pm, 1 pm - 5 pm and 5 pm - 9 pm. Volunteers help by preparing bedrooms upon a family's departure, wash and put away linens, monitoring the space, checking families into our sleeping rooms, welcoming new families, making beds and assisting with laundry, answering the phone, baking and interacting with families and children. Parking is provided. Contact Kasia James, Family Room & Volunteer Manager, at 204-787-4626 or kasia@rmhmanitoba.org.